Hummingbirds hover on lacy ecru panels that provide a light, airy look. This 84"l Hummingbird Lace Panel has a rod pocket top. Machine wash polyester. Imported. 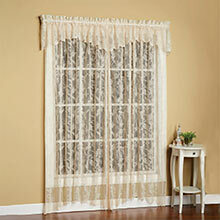 56"w. To get the look pictured, you need 2 Valances and 2 Panels. Best for $$ ever seen. Don't hesitate. Will be ordering again soon. These curtains were everything I was hoping they would be. They are simply gorgeous and for the price fantastic! 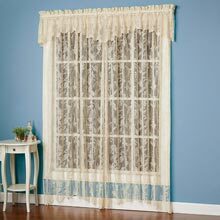 These hummingbird lace curtains are absolutely lovely! The shade is more a warm buttery color than ivory/ecru. They are light and airy and very well made. 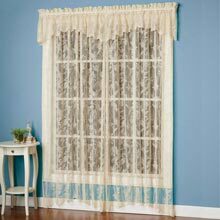 You can't go wrong selecting these curtains at such a low price! A great way to freshen up your room decor at a tiny price. The BEAUTIFUL review prior to mine was completely accurate and extremely helpful. 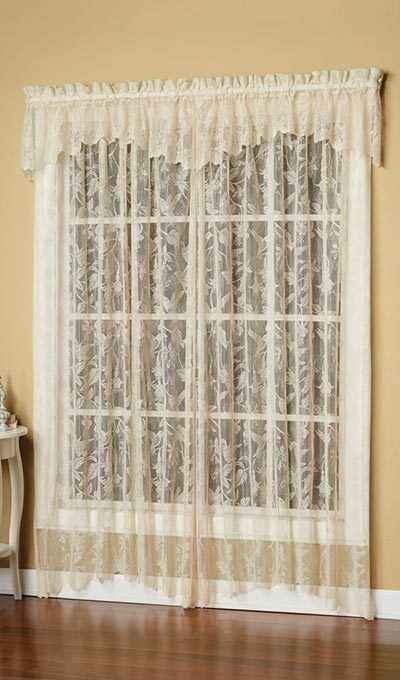 These curtains are almost a light gold color which is a beautiful contrast against the white window trim. This price - now even lower than I paid cannot be beat. These are truly so so pretty. 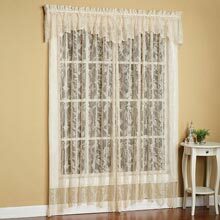 These curtains are absolutely beautiful, well made and make a great impact on the window and the room. If you are looking for an ivory/lighter shade this is not it, but(for me) the ecru color lends to that antique look. What a buy...so pleased!!! !